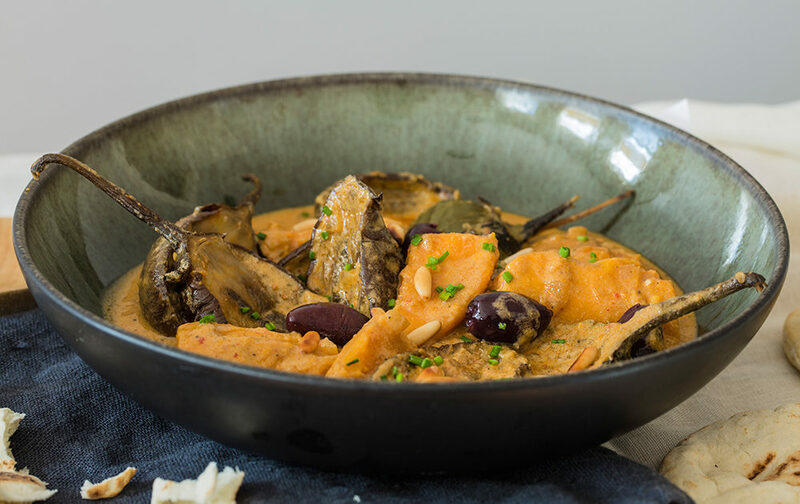 A few tablespoons of Tahini in the sauce, soft sweet potatoes and tender aubergines, contribute to make this stew comforting and easy-to-make. However the combination of pulpy ingredients should not be an excuse for a happy mush. I found that baby aubergines keep their shape when cooked; chose them. You may decide to go for a large aubergine which you would cube, but it will melt in the cooking and won’t look as good. I also picked the pink variety of sweet potato because it adds colour. Combine the olives last as they too can bleed into the sauce and give it a murky hue. Trim the aubergines, remove the calyx but leave some of the stem. Cut in half, brush with oil and season with salt. Cover an oven tray with baking paper and place in the oven at 180C for 20 to 25 minutes, until the aubergines feel soft. Heat 2 tablespoons of olive in a deep pan and sauté them with a pinch of salt until they soften. Add the garlic and cook on low to medium heat for another minute or so. Add the sweet potato wedges. Cook and toss them for about 10 minutes. Remove the roasted aubergines from the oven and add them to the mixture. Sprinkle and stir the spices. Pour the vegetable stock over and bring to a boil. Once it starts to bubble, reduce the heat to medium low, cover, and leave to cook for 20 minutes. With a slotted spoon, lift aubergines and potatoes out of the pot and keep them warm. Stir the tahini into the sauce, increase the heat and bring to a slow boil. Cook the sauce until it begins to thicken. Stir in the limejuice and the olives and return the vegetables to the pot. Simmer for 5 more minutes to combine the flavours. Leave to rest for 10 minutes before serving garnished with pine nuts and chives.